This is the most sophisticated handbag design of all my small purses… and my favourite! Sophistication… just what I had in mind when designing it! So I looked to the elegant Art Nouveau style for inspiration. It was a great success in the late 19th century, inspiring architects and designers… and it still continues to capture our imagination today. Art Nouveau’s shapes were inspired by nature with wonderfully sinuous contours and ‘whiplashes’ and sophisticated asymmetrical compositions. So I created an asymmetrical design with three brightly coloured curvaceous flowers and stems, balanced by one multi-coloured flower bud to the right of the design. I intentionally selected the flower colours in a contemporary range of hot pink, orange and gold as an ideal contrast to the mauve background. The predominant mauve colour was crucial in order to coordinate with other accessories in my wardrobe. 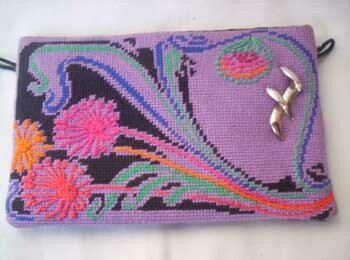 As a finishing touch to the needlepoint bag, I added a silver pin that I happened to have which reminded me of the typical Art Nouveau ‘whiplash’ curves of the leaves. Cotton needlepoint yarn was used throughout because of the colour clarity I was looking for with the handbag design and also because its fineness was ideal for creating the delicate stems and flowers. Normally I like to use the standard 'Tent' stitches for most of my needlepoint tapestries because of the generally ‘unfussy’ graphic nature of my designs. But this needlepoint handbag design would be compromised without a continuous natural line for the stems of the four flowers. I used a ‘STEM STITCH' in the same colours as the flowers to carry the eye across the bag to hightlight the brightly coloured flowers. 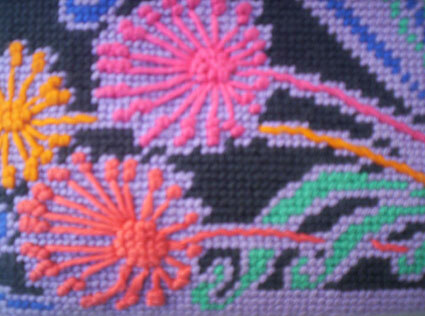 This type of stitch also adds a ‘relief’ effect to the tapestry. Another stitch, known as a ‘FRENCH KNOT', was used to create the several ‘stamens’ for the flowers; this adds another lovely three-dimensional quality to the needlepoint design. I normally wear the ‘Four Fleurs’ handbag on one of my silver chain belts. I decided to attach two small loops to the bag so that I could add a thin cord or leather strap when I wanted it to become an evening bag, as shown by our model. This needlepoint bag with its sophisticated colours and timeless design provides a dramatic colour accent to any smart contemporary outfit… such as the one our model is wearing. It is a truly versatile addition to any wardrobe! SAME OUTFIT... TOTALLY DIFFERENT LOOK! By my scaling back the entire colour intensity of the design, the delicate and graceful shapes of the flowers become more prominent...giving an entirely different look. This new look was achieved by selecting a cool colour range of green and blues on the flowers to the left, with a stronger fuchsia-coloured bud to the right… all set on a soft light grey background. What a great example how a simple belt bag can give you a totally different look to the same outfit! 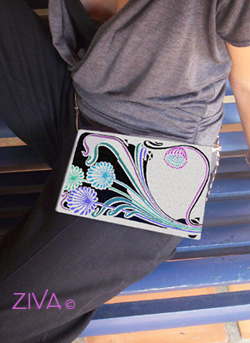 Click here to GO SHOPPING FOR SMALL PURSES with ZIVA! Please go to ‘Under the Big Top’ Belt Bag, to see how I used these special stitches in that handbag design.